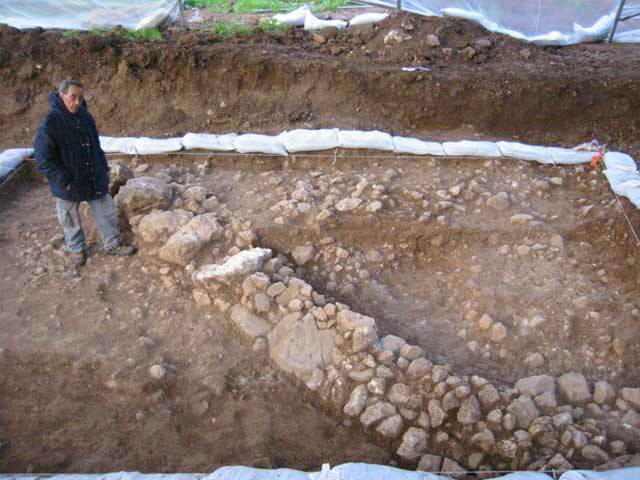 During February 2004, a salvage excavation was conducted in Sulam (Tel Shunem; Permit No. A-4101; map ref. 2315/7237), following the discovery of ancient remains during the construction of a house. The excavation, on behalf of the Israel Antiquities Authority, was directed by K. Covello-Paran (field photography), with the assistance of V. Essman and V. Pirsky (surveying), E. Amos (photo of Fig. 6), H. Tahan (drawing), H. Rosenstein (coin cleaning) and D. Syon (numismatics). 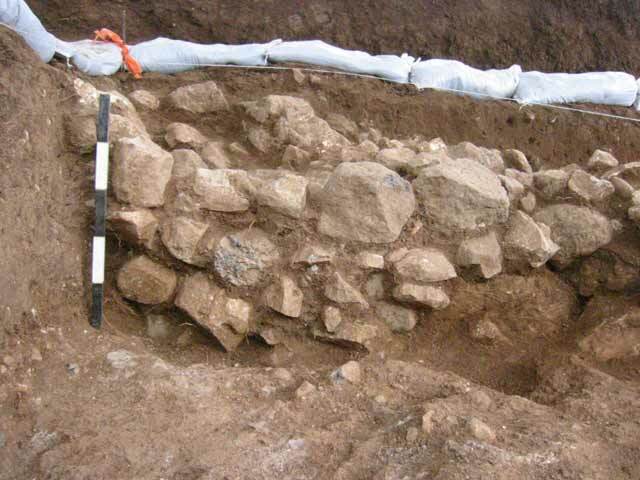 A preliminary report of this excavation was published in HA-ESI 118; due to unforeseeable circumstances, the present report is a complete publication of the excavation. Sulam is located in the Jezre’el valley, at the foot of Giv‘at Ha-More, next to Nahal Shunem (Figs. 1, 2). A modern cemetery is located on a tell of 25 dunams that stands in the center of the village. The archaeological site is identified with ancient Shunem, mentioned in both Biblical and extra-Biblical sources. 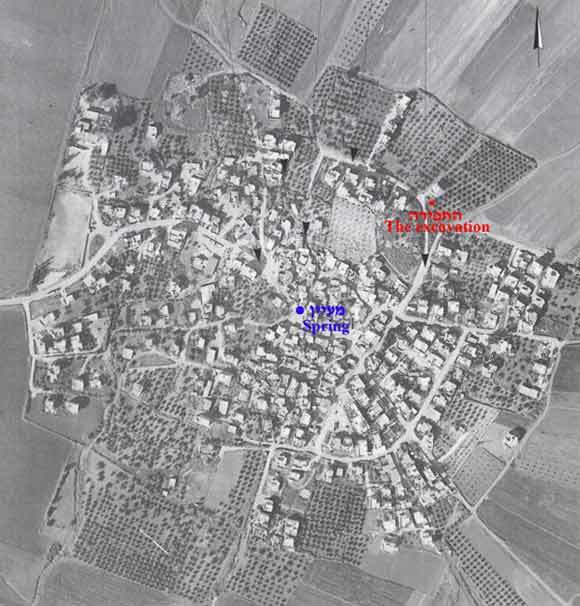 The site has been extensively surveyed in the past (Map of ‘En Dor , Site 37) and numerous small-scale excavations have been conducted at the site on behalf of the Israel Antiquities Authority (HA-ESI 120; HA-ESI 121). Prior to the excavation, a 1.5 m overburden of sterile alluvial soil was removed with the aid of mechanical equipment. A single square (4 × 6 m) was excavated to a depth of 1 m; two strata that dated to the Roman period (I) and Early Bronze IA (II) were exposed (Figs. 3, 4). Two coins (IAA Nos. 106522, 106523), dating to the Byzantine Period (second half of the sixth century CE), were found in the initial descent of the excavation. One of the coins (IAA No. 106522) is an Arab-Byzantine coin that imitates the coins of emperor Constans II and is dated to 640–660 CE. 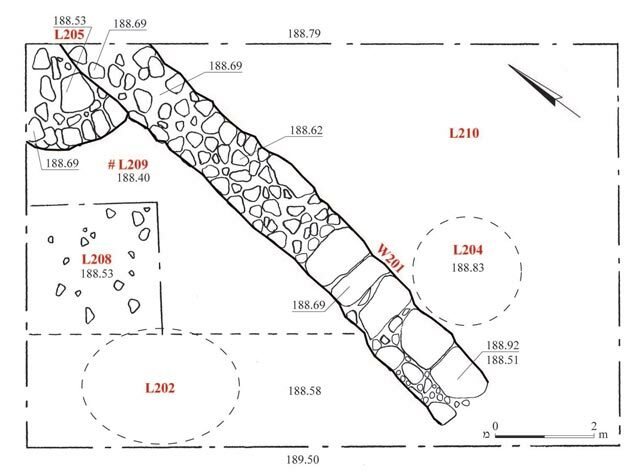 An accumulation of occupational debris (L210) and two pits (L202, L204), which penetrated into the ruins of the Stratum II building, were associated with this stratum. The pottery vessels recovered from Stratum I were very fragmentary and included bowl fragments, kraters, a cooking pot and jars, all dating to the Middle Roman period. 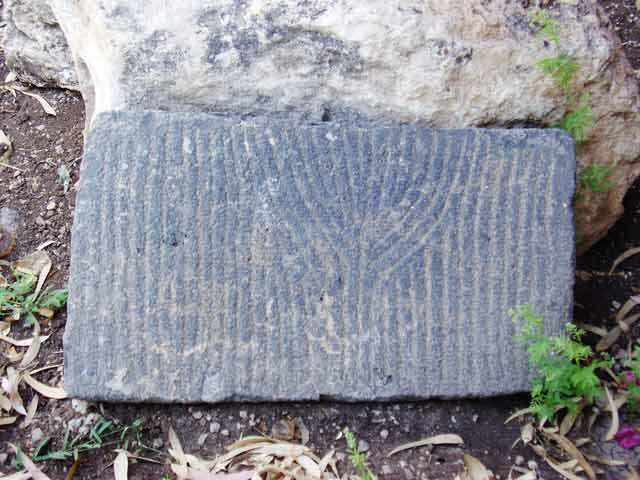 Additional finds included animal bones, tesserae, marble fragments and a complete striated ‘Olynthus’ basalt millstone (length 0.7 m, width 0.4 m, thickness 0.07 m; Fig. 5). Part of a building was excavated (Figs. 4, 6). A long wall (W201), traversing the excavation square from north to south, was constructed from both a single row of large stones and two rows of medium-sized stones, with a core of smaller filler stones. The wall was abutted by a semicircular stone-built platform (L205; Fig. 7) and a living surface (L209). The platform was apparently placed at a corner between the W201 and a probable wall (not excavated) that ran in an east–west direction and was due north of the excavated area. Both W201 and Platform 205 were preserved to a maximum of 0.5 m high. The pottery assemblage associated with Stratum II dated to Early Bronze IA and included bowls (Fig. 8:1), holemouth jars (Fig. 8:2–7), rim and base of a storage jar (Fig. 8:8, 10), a pithos (Fig. 8:9), ledge handles of closed vessels (Fig. 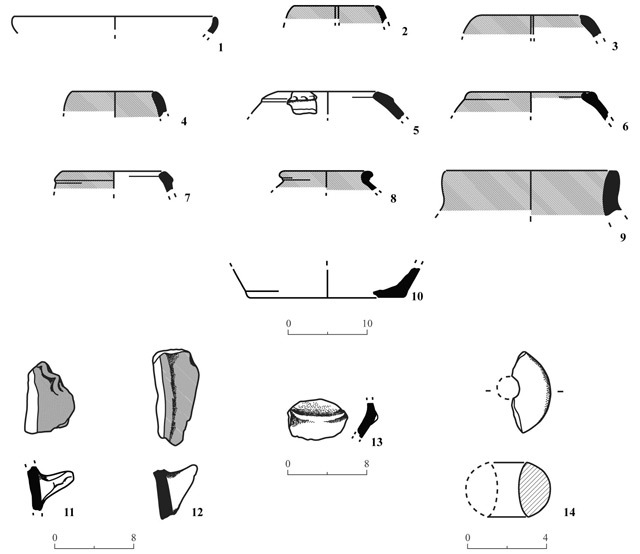 8:11, 12), a gray-burnished potsherd (Fig. 8:13), as well as a basalt stone whorl (Fig. 8:14). 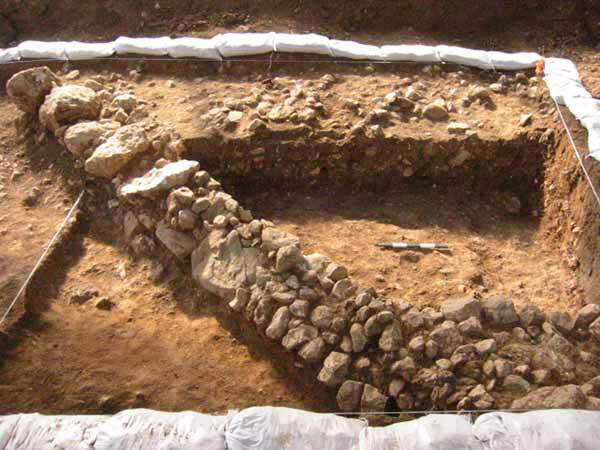 The architectural remains of the earliest Early Bronze I occupation at Tel Shunem were exposed for the first time at the site during the present excavation, previously known only from surface reconnaissance. The location of these remains, beyond the reconstructed line of the Middle Bronze Age fortification, suggests that the MB II settlement receded when compared to the EB I occupation, at least in the northeastern area of the site. The Roman-period pits point to various activities that took place adjacent to the agricultural fields in the area, which are topographically lower than the main part of the site. 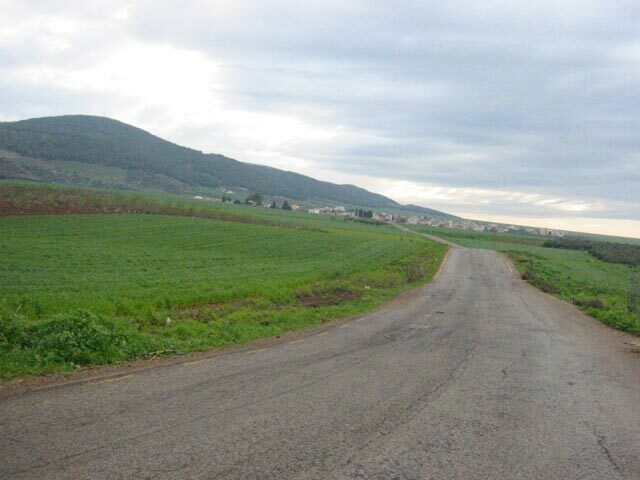 Furthermore, the excavations have, once again, exhibited the existence of archaeological sites ‘buried’ below seemingly sterile alluvial soils along the margins of the Jezre’el Valley. 2. Sulam located at the foot of Giv‘at Ha-More, looking east. 3. General view of the excavated area, looking southwest. 6. Stratum II, Building 209, looking northeast. 7. Stratum II, Platform 205, looking north. 8. Stratum II, pottery and stone finds.